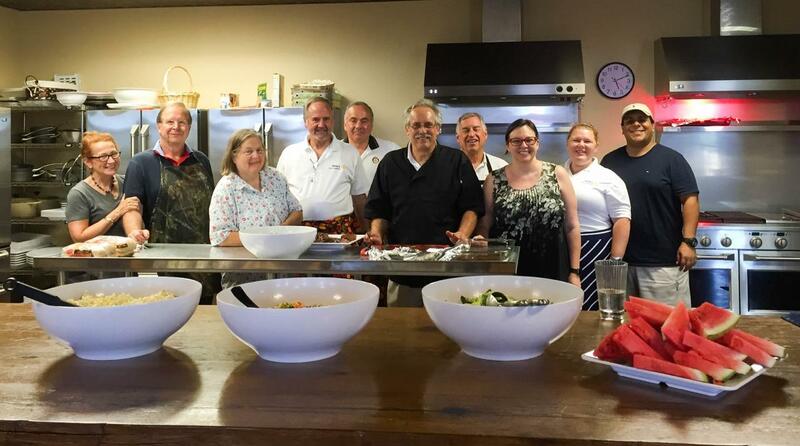 On Saturday, July 9th, 2016 Rotarians prepared and served dinner to a group of Veterans and their families staying at Boulder Crest Retreat in Bluemont, VA.
A privately-funded rural wellness center, Boulder Crest is dedicated exclusively to our nation’s combat veterans and their families and is committed to improving their physical, emotional, spiritual and economic well being of this remarkable community of heroes ensuring they have the opportunity to succeed in their new mission of life here at home. Shown in the photo are John Whisler and his wife Mary Lou, Steve Krisa and his wife Cherie, Chuck Reavis, Ernie Carnevale, Ron Rogos, Valerie Beaudoin, and Rachel De Llanos and her husband Peter. The food was great-directed by Chefs Ernie and Valerie.